Download Google Earth at http://earth.google.com/download-earth.html. Download the MapFinder file at http://www.usgsquads.com/mapfinder.html. Browse to and open the “.kmz” file from within Google Earth. When it opens, you will notice a menu within Google Earth that allows you to choose a state of interest. Once you have chosen a state, zoom in on that state and you will see the topographic map boundaries, each with a clickable blue information symbol. 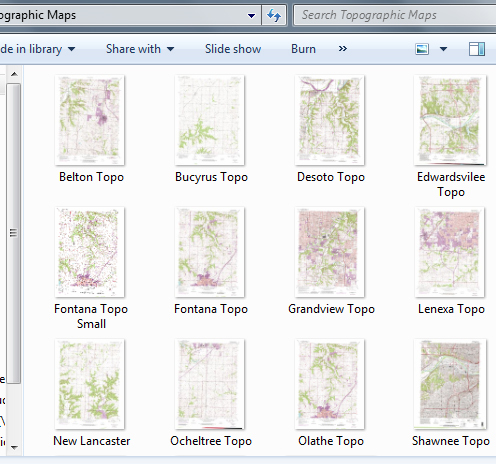 Hover over a particular information symbol, and you will see the name of that topo map. Upon clicking, a web page will open, where you will see a link to download a tiff file of that map. The tiff file is your free digital copy of the topographic map. Have fun exploring the US digitally, but I hope these maps give you the knowledge to explore in the real world as well! It would be nice if Google Earth had a Topo Layer you could add. Perhaps there is and I have just not found it yet.